How to Search the Marketplace - Updated! ForumsArrowMarketplaceArrowHow to Search the Marketplace - Updated! 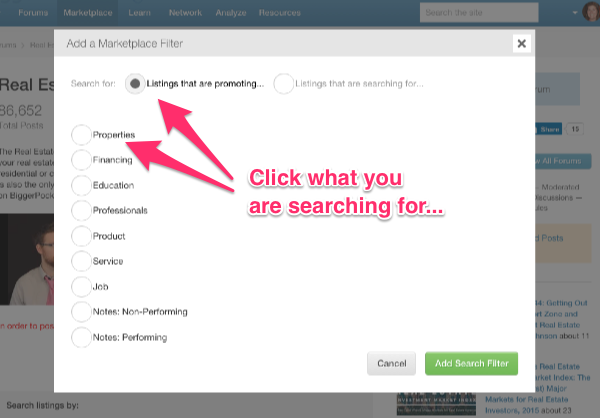 We've added some search features to the Marketplace, to help you zero in on what you are looking for. From the Marketplace Forum, click Add a Filter. As you add filters, more refined choices appear. You can click the "Add Search Filter" button at any point to search for a more broad range, or continue to add filters to narrow the search results. In the photo below, I chose to search for Listings that are promoting properties, residential, Triplex. Once I click "Add Search Filter" my results will filter out everything that isn't a listing offering residential triplexes. 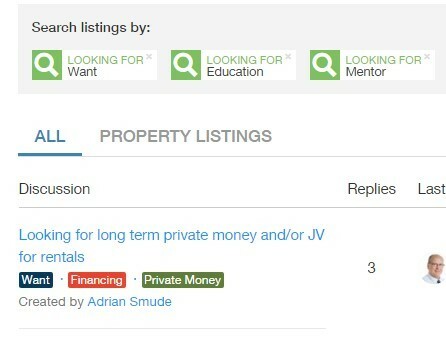 You can make the listings as narrow or as wide as you would like - stop filtering after the first column (Properties) to get a complete list of all properties being offered on the Marketplace. 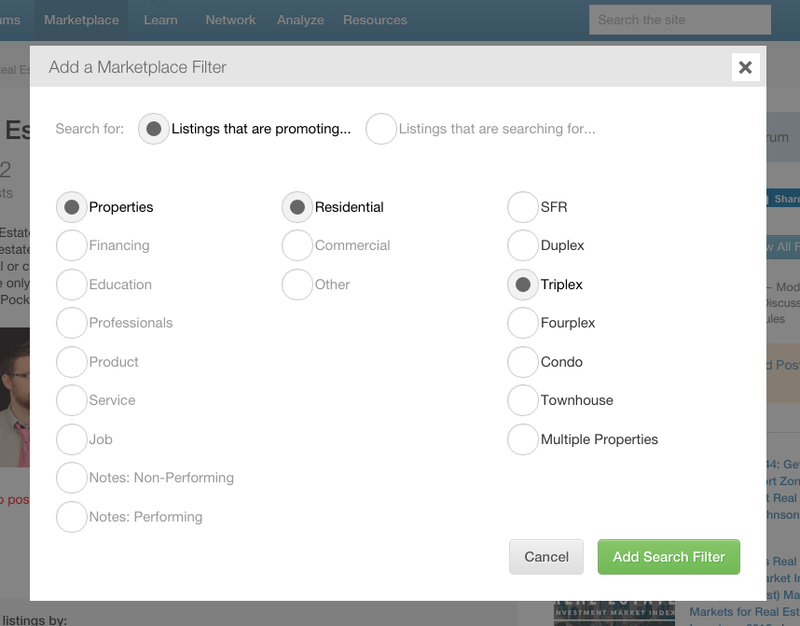 Stop filtering after the second column (Residential) to get a list of all residential properties being offered on the Marketplace, or choose an option in each column to make the search results as focused as possible. I hope this makes searching the site easier. Let me know if you have any questions! I see there is a tab to search for properties. How about searching for properties in a particular state? Mindy Jensen for the great tips. I would agree with Dawn, We need to set this up to search by Location. Otherwise it does not make sense. I agree with the feedback above. I'm searching for a multi-family in NJ and would love to better utilize the marketplace. However- even with the filters- it still shows 300+ pages to sift through. Searching via location would be CLUTCH in time saving and targeting search. Most people invest in their own backyards or have targeted areas for investment opportunities. Thank you! This site always is improving! Searching via location will be great! Filter by location is now added! Your awesome @Mindy Jensen ! Sorry if it was there along and I didn't know it. I definitely appreciate the image capture for instruction! @Paige Clarke , this is a new feature. NICE!!!! This will help out everyone a ton!!! Thank you!! Thanks Mindy.. this is awesome! thanks for such quick response to the needs of your members!!! I am a private lender. How can I post an ad for my products, nationwide? Is there a filter for mortgages? Ads are only allowed in the Marketplace. 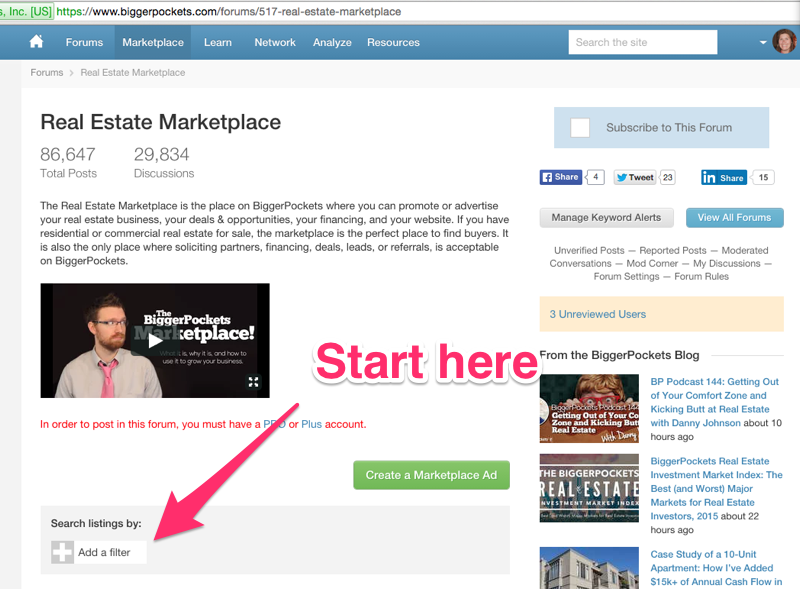 As a Pro member, you can post in the Marketplace, but there are limitations. You may post up to 2 times a day, and you may repost an ad once every 5 days. Ads are only allowed in the Marketplace. As a Plus member, you can post in the Marketplace, but there are limitations. You may post up to 2 times a day, and you may repost an ad once every 5 days. Hi Mindy, when you refer to repost an ad once every 5 days, what does the repost means? Is there a repost feature/link I can use to repost the original post or you mean i can post the same post afresh in the marketplace? It seems that the filtering may not be working correctly. You'll see in the screen show below that I have a filter set to Want=>Education=>Mentor, but all the Want-related posts are showing up in the results list. See the first search result: "Want=>Financing . . . etc.. The Marketplace is split into Haves or Wants. If you have something to offer, you post in the Have section, and if you are looking for something, you post in the Want section. When you are searching for things being offered, you should filter on Have, because you are looking for a listing that is offering something. Thanks for your response. In this case, I'm looking for posts (wants) about Mentoring. So I added the three-level filter "Want=>Education=>Mentor." I think this should limit the search results by all three of these categories and only show items/posts where users "want a mentor". However, the results show all "Want" listings. Ah. Thanks for clarifying, @Ted Dansen . Let me do some digging. Thanks for sharing this, @Ted Dansen . This is a bug, and we are working to repair it. In the meantime, this link will get you where you want to be. I can't get the save after choosing the filter choices. It is nowhere to choose. It scrolls down without changing. I am using Firefox. Is anyone else having this problem? Hi @Debra Hellman . There isn't a Save option. It should be Add Search Filter. The new look and functionality in BP is awesome.